It's a Pierle Hamily Fug! : Treats on Thursday! I will continue my theme of things I love about the winter to add one of my favorite winter treats. If you don't know already...I am addicted to candy cane EVERYTHING! 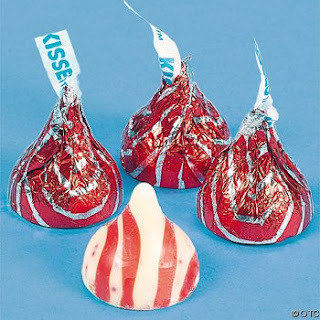 That's right my friends....some DE-Lightful Candy Cane Kisses. I can't even begin to tell you how much I love them. 2 things you must know about! Peppermint mocha creamer. Yummy in coffee but especially good in hot chocolate. Trader Joe's Peppermint Joe-Joe's. It's an oreo but the cream has peppermint crushed up in it. So good. And to make it all fantastic. Hot beverage with the peppermint mocha creamer. Whipped cream on top (and you can even crush up a peppermint hard candy to make it pretty). And dunk those Peppermint Joe-Joe's... HEAVEN! You're killing me here! I love all candy cane stuff too! LOVE peppermint Joe Joes! Don came home with, get this... candy cane covered truffles from TJs!! !